NAID’s AAA Certification: What Does That Mean for Our Customers? Federal Records Management and Shredding is proud of our AAA Certification from the National Association for Information Destruction (NAID). NAID is the trade association for the document destruction industry. 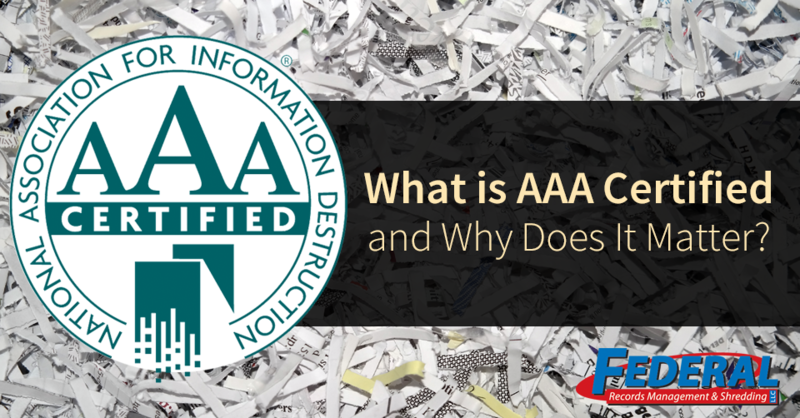 Its mission is to promote “the standards and ethics of its member companies.” To receive the voluntary AAA Certification from NAID, a paper shredding company must meet and uphold strict requirements every year. How does AAA certification benefit you, our customer? By choosing a NAID AAA Certified company, you protect your business, your staff and your clients/patients. The use of a AAA certified facility fulfills federal regulatory requirements that affect your business and validates your information destruction policies and procedures. Through the AAA Certification Program, NAID assesses the mobile and facility-based operations and destruction of paper, printed media, micromedia, and computer hard drives. The certification must be renewed every year. The purpose of certification is to guarantee that the facility is meeting all of the numerous laws and regulations that protect confidential customer information — thereby, protecting your business and your customers. The audits are unannounced, so we must operate every day and every hour as if an audit will occur. Verify that all materials are crosscut shredded, incinerated or pulped in such a way that they cannot be reconstructed. Examine storage containers used for information to be destroyed to verify the containers are secured. Verify that cardholder data on electronic media is rendered unrecoverable via a secure wipe program in accordance with industry-accepted standards for secure deletion or otherwise physically destroying the media (e.g., degaussing). Verify the security of confidential documents throughout all stages of the shredding process such as handling, transporting, storing materials prior to destruction, and destroying and disposing of materials responsibly. This also includes any transfer of custody scenarios. NAID’s certification program was “developed by information security professionals and recognized by thousands of private and governmental organizations around the world”. Federal Records Management and Shredding, a locally-owned business in downtown Fort Wayne, is proud to be a AAA Certified shredding company and offers our customers the very best in confidential shredding services and destruction. Contact us today to learn more about our shredding services to protect you, your business, your employees, and your customers. Next Next post: What Happens to Paper After it’s Shredded?